Over 100 years of speculation and controversy surround claims that the great seventeenth-century Dutch artist, Johannes Vermeer, used the camera obscura to create some of the most famous images in Western art. 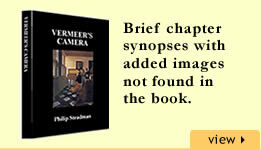 This intellectual detective story starts by exploring Vermeer's possible knowledge of seventeenth-century optical science, and outlines the history of this early version of the photographic camera, which projected an accurate image for artists to trace. 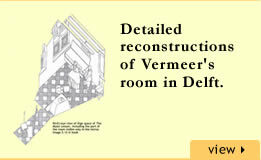 However, it is Steadman's meticulous reconstruction of the artist's studio, complete with a camera obscura, which provides exciting new evidence to support the view that Vermeer did indeed use the camera. These findings do not challenge Vermeer's genius but show how, like many artists, he experimented with new technology to develop his style and choice of subject matter. The combination of detailed research and a wide range of contemporary illustrations offers a fascinating glimpse into a time of great scientific and cultural innovation and achievement in Europe. 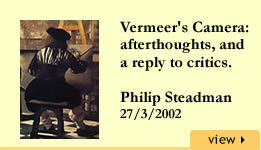 'Vermeer's Camera' is a book by Philip Steadman, published by Oxford University Press. 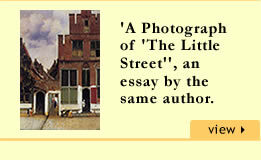 It is published in paperback in April 2002. ISBN: 0-19-280302-6. Price £10.99 in UK, $16.95 in USA. The hardback is now out of print.